Washington – As early as January, shortly after the inauguration of President George Manneh Weah and Vice President Jewel Howard Taylor, Representative James Biney (NPP, District No. 1 Maryland County) reportedly commenced what aides to the Vice President are describing as a plot to change county chairpersons of the National Patriotic Party, who appeared reluctant to collude with a plan hatched by Biney to agree to remove the Vice President from the party as standard bearer. One source confiding to FrontPageAfrica Monday said, the plot was hatched on the assumption that the vice president would be against a permanent merger of the NPP and the CDC. As a result of engagements with the county chair and their refusal, one source explained that some partisans of the NPP brought a complaint to the party and the National Elections Commission to have Rep. Biney expelled as chairman of the party. It was that ill-fated plan, the source told FrontPageAfrica Monday, which angered partisans and NEC members which cumulated into a hastily-arranged convention last weekend to have the vice president removed from the party. 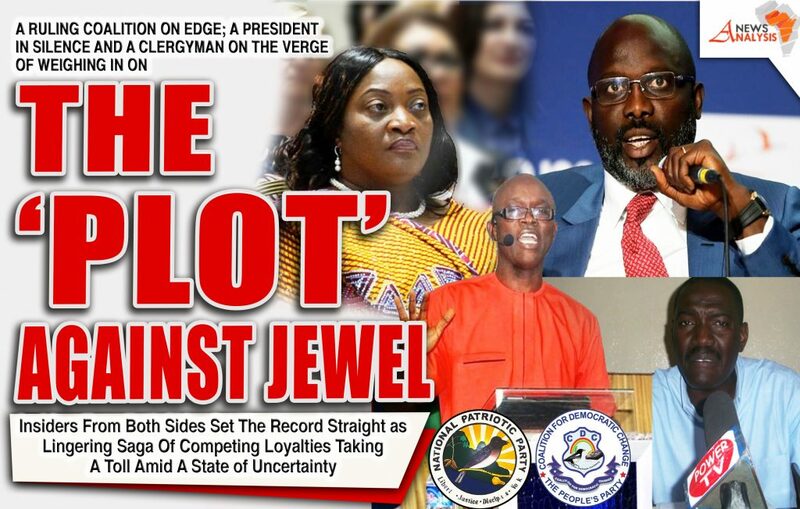 “They had planned that she (Jewel) would be a six-month Vice President and when it did not work, they began devising ways to effect their plans,” the source added. Since January, a number of actions appear to validate reports of a serious push to make the VP an illegitimate vice president. Shortly after his inauguration in January, President Weah sought to wrestle control from the VP’s office, including an attempt to deny her the constitutional right as President of the Senate responsible for presiding over its deliberations without the right to vote, except in the case of a tie vote. Then last week, the President submitted a bill to the legislature seeking to wrestle the VP’s control of the Liberia National Lotteries after reports surfaced that the VP had left the country without informing the president. FrontPageAfrica would later learned that the President’s Chief of Protocol kept the VP waiting for three hours before telling her that the President was busy. And even though she left a file explaining the purpose of her trip, she was asked to returned home after her departure but she declined, expressing unhappiness about the lack of respect shown her by the President. Last Saturday, the NPP, a brainchild of jailed ex-president Charles G. Taylor, at its convention voted to expel the Vice President from the party, going as far as recommending to President Weah and the ruling Coalition for Democratic Change (CDC) to strip her off her governmental post. Madam Taylor served as standard bearer of the party. She’s also the ex-wife of former President Taylor. The chairman of the party, John Gray, is also suffering similar fate. Interestingly, the expulsion of the two executives was orchestrated by former chairman James Biney who was expelled in October this year by the grievance and ethics committee of the party. Biney said the pair were expelled because they had gone against the party’s constitution and tried to bring division within the NPP and by extension the governing Coalition for Democratic Change (CDC). “Any institution that does not respect its bylaw is bound to fail. We are more hopeful than three years ago. We are into power right now,” Biney, who and VP Taylor have been embroiled in a war of words over the leadership of the party, said. So far, the office of the Presidency has been mum about the aura in the air regarding the vice president with some around the presidency and the Coalition for Democratic Change insisting that the President is unaware about the ongoing plot against his vice. One insider to the Presidency told FrontPageAfrica Monday that contrary to what is public domain, the ongoing fracas is being mastermind by a segment of the NPP influenced by Vice President Jewel Taylor, who recently began an internal consensus for the NPP to accept the return of officials that resigned from the NPP when the Coalition supporting President Weah was formed. These officials, the source to the presidency explain, had resigned and supported the Unity Party and the ALP. Key amongst them were Sen. Sando Johnson, Andrew Peters, George Mulbah etc. The source further explained that this segment of the NPP acting under the influence of the vice president insisted upon their return and to have them reinstated in their offices they once occupied before leaving to support other parties; they succeeded, as Sando Johnson was reinstated to his vice chair position and Andrew Peter was reinstated to Secretary General position/NPP. The source went on to explain that the pro-Biney group refused to honor the action, which was largely influenced by the Standard-bearer, which triggered the noise surrounding the ongoing saga. The source told FrontPageAfrica that the VP, determined to persuade President Weah about the decision, proceeded to his office at CDC headquarters, accompanied by Sando Johnson and Andrew Peters. President Weah, reportedly summoned party chair Mulbah Morlue to listen to what he had to say about the matter. President Weah, according to the source, advised the VP that ‘It was a very bad precedent she was attempting to set, but said it was an internal matter of the NPP’. The President, the source furthered, explained that he had personally called Andrew Peters during the 2017 campaign, advising him not to leave the coalition where he served as deputy secretary. Speaking further, the President, according to the source, said in that meeting, that Mr. Peters dined with him at his house and the next day, decided to declare support for UP’s Joseph Boakai. The President reportedly told the gathering, “that was his constitutional right”. The source explained that the president, reading about the violence and lawlessness on social media, asked the party chair Morlu to call a meeting of the Governing Council to resolve the situation. On October 22nd, 2018 a well-attended meeting which also included President Weah and VP Howard Taylor was called. The president reportedly arrived and decided that he would not hold the meeting with all governing council members, but would ask senior officials to proceed to his office so as to preserve the respect of his Vice President. That meeting was also attended by Rep. James Biney, the vice president Howard-Taylor, former Speaker Alex Tyler, representing the Liberia People’s Democratic Party(LPDP); Chief Cyril Allen, representing the NPP, Nathaniel McGill, Minister of State and Samuel Tweah, Minister of Finance. In that meeting, the source explained, both Biney and Jewel, took turns to explain their versions of what was unfolding in the party. The president reportedly advised both of them to return and settle their differences as it was an internal matter. The President, according to the source, cautioned the feuding pair, that they were embarrassing the Coalition and the image of the government with the public fight, advising them to return and unite the NPP, because whatever affects the NPP would affect the Coalition. At the meeting, the source explained, the VP insisted that she needed help to resolve the matter at their headquarters, prompting President Weah to asked the party chair Morlue to step in and help the pair resolve their differences. The Vice President, the source explained, returned and held a meeting with her officials, but Rep. Biney was notably absent. The VP reportedly organized a second meeting and asked party chair Morlue to attend so as to assist her talk to the NPP executives in hopes of bringing the matter to a close. Party chair Morlu, reportedly went to the meeting with senior coalition members, including Tyler, Chief Allen, and others. The source from the presidency explained that the NPP officials led by the VP and John Gray, decided at that meeting to pull out a resolution meant to be sent to the President and the public against the advice of Chairman Morlu who the source said, tried endlessly to advice the VP faction of the NPP feud, that it would not be wise to read a resolution that would not bring resolution to the NPP. Mr. Morlu, according to the source, decided to ask the VP faction to postpone the resolution and hold more consultation and see whether there would be an amicable ground for Compromise. “The Moment the VP saw that Mr. Morlu’s advice was gaining traction with the NPP officials, she jumped into the debate and sided with those that were still calling for Hard-lines that would keep the NPP divided,” the source averred. Three days later, according to the source, the feuding parties returned to the NPP headquarters but the debacle was far from being resolved as both sides remained stubborn as ever, insisting that Peters, Sando Johnson and others be reinstated and Biney remain expelled. “During that meeting, the VP was clearly revealed as the mastermind of their actions,” the source from the presidency explained. FrontPageAfrica has learned that following that meeting, party chair Morlu returned to brief the president about the NPP officials’ refusal to yield. The President reportedly told Chairman Morlu that he had reached his peak in trying to resolve the issue – and his hands was out of the fray. “The President did not want to be seen as interfering in the domestic affairs of the NPP – and that was the furthest of his involvement in the matter,” the source said. The source added that upon the advice of senior Coalition officials, chairman Morlu took the matter to the Governing Council. A meeting of the council was convened on November 2, 2018 at party headquarters. At that meeting, the Council which is the highest decision-making body of the coalition reached a decision, advising all sides to return to status quo ante. A subsequent letter was written and sent to the NPP, NEC, the Vice President and Rep. Biney. However, instead of reverting to the Governing Council if there was a dissent with the Council’s decision, the NPP went public and began to rain verbal onslaughts against leaders of the coalition. The source from the presidency added that the NPP faction loyal to the Vice President, decided to take the coalition and its leaders to court, claiming the coalition was interfering in their domestic affairs. The source said prior to the issuance of the writ of summons, the presidency had decided to leave the VP and Biney alone to solve their problems the best way possible. “This is the long road that got Jewel and Biney where they have arrived today,” the source. The source accused the vice president of fighting to consolidate power around herself in the NPP and is cushioned by the presence of Senator Sando Johnson and Andrews as executives. Another point of contention between the VP and Biney, the source says, has been that the NPP constitution does not allow her to run for two terms, but that she’s using the returning officials to amend the constitution of the NPP to allow her run for a third term, given that she feels she will not keep enjoying Biney’s support. Amid variations of explanations from both sides of the aisle, Pastor Joseph Gardea Johnson, III, of the Restoration Baptist Ministries on the Old Road, who has been privy to interventions between both Biney and the Vice President and the VP and President Weah has promised to come out this week with his version of the root of the ongoing debacle. Amid the confusion, Chief Allen, appearing on the OK FM afternoon talk Monday took issue with the manner in which the Biney-led group illegally ousted the vice president from the party. He said that VP Taylor remains the standard bearer of the NPP. He at the same time said he does not acknowledge the expulsion of James Biney from the party. He pointed out that officials of the party were proceeding wrongly. Chief Allen is also the National Chairman of the Governing Council of the Coalition for Democratic Change. He said the decision to expel VP Taylor is reckless and irresponsible, noting that he cannot be associated with such a decision. Chief Allen both sides are proceeding wrongly, that it was wrong to conduct a meeting and expel the standard bearer and doesn’t make a lot of sense. The elderly statesman of the party cited the lack of jobs for NPP partisans as a major contributing factor to the ongoing fracas as he described the decision to expel the VP as reckless and does not recognize the decision as the gathering to oust the VP from the party was illegal.